Our hens are happy. They have lots of room to scratch and roam, a safe, comfortable, clean place to sleep at night, and an organic and very varied diet—especially right now, when they are getting lots of weeds and other goodies I have pulled from the garden. They also get regular affection, praise, and kitchen scraps from me. Five yolks I used in some ice cream recently. The darker yolks are the result of lots of greens in the chickens' diet lately. Happy hens lay excellent eggs. And because our eggs have been especially beautiful and delicious this year, I’ve been putting them on just about everything. Here’s what I mean. 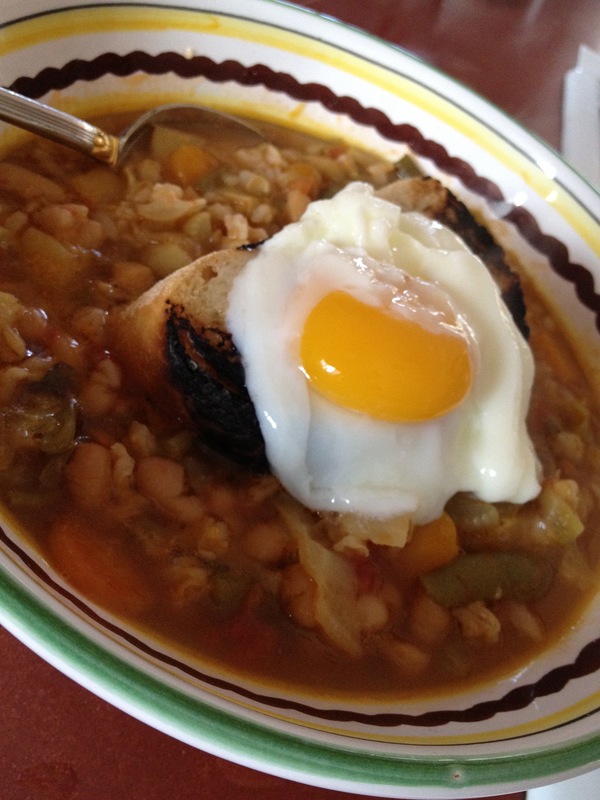 You may remember this one from before–our post-Italy minestrone. This was back in the fall. Bruschetta with my homemade baguette, toasted and rubbed with garlic. Topped with chard from the garden blanched and sauteed with a bit of garlic, then topped with gruyere and a poached egg and chives (from the garden). This was back in January, right after I brought home some smoked salmon from a work trip to Seattle. And this was two weekends ago. 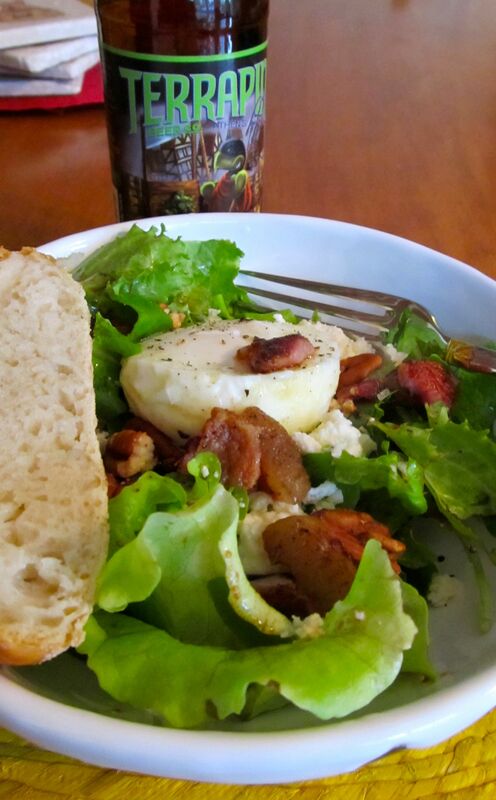 Salad of mixed greens from the garden, topped with toasted pecans (from a tree near my house), pancetta from Pine Street Market, some fresh cheese, a vinaigrette of balsamic and olive oil we got in Italy, a poached egg, and a slice of homemade bread. 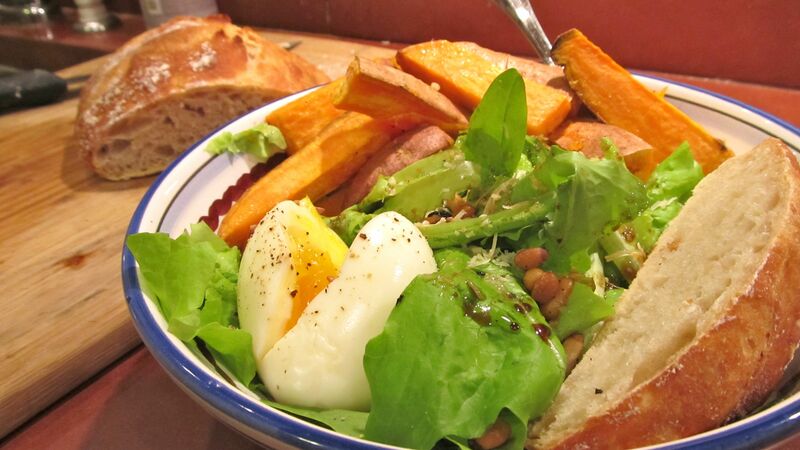 Salad of mixed garden greens, toasted pine nuts, parmesan cheese, same vinaigrette as above, oven roasted sweet potato spears (from Decatur Farmer's Market) with garlic, slice of homemade bread, and soft-boiled egg with black pepper. Just found your blog. You are right we let our “girls” roam in the yard and their yolks are defiantly darker and more rich. 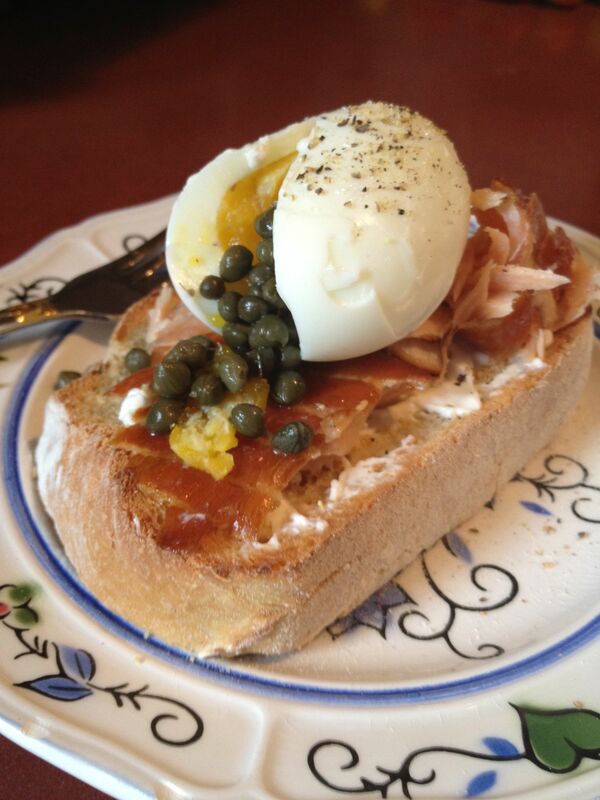 I love the cooking ideas for eggs as sometimes you get so many you need new ideas. Stunning eggs! Clearly from well-loved hens. Nice work! With the eggs my girls are producing I am baking an angel food cake about every two weeks. Suggestions for remaining yolks besides spong cake, lemon curd, cream brulee and ice cream? I think you have covered everything I would think of! Especially the ice cream. Put an egg on it 🙂 I’m guessing you’re as big a Portlandia fan as I am. Gorgeous photos! 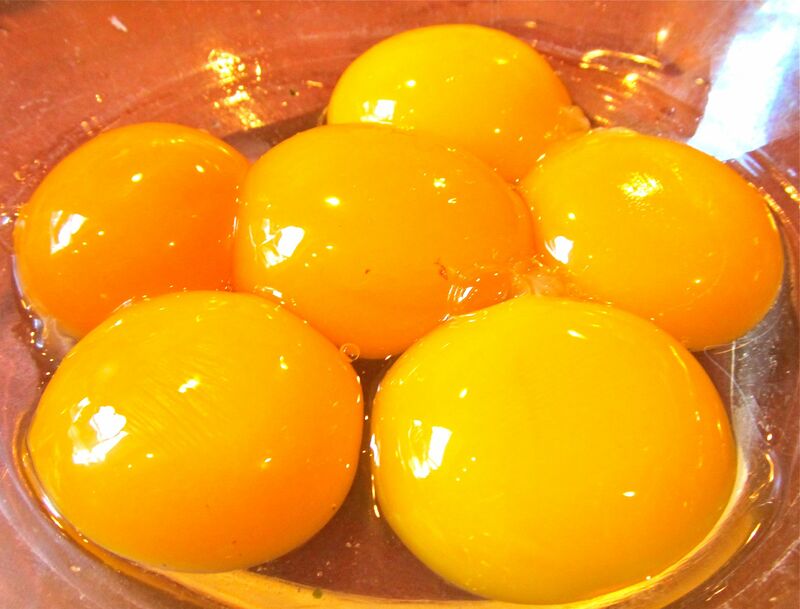 Those yolks look like they are overflowing with nutrients. 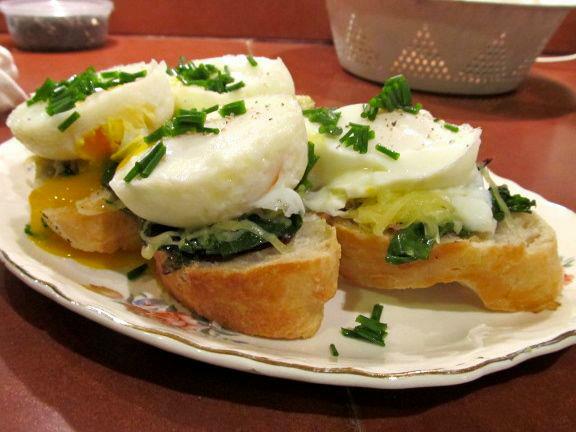 I love how creative you’ve become with your egg recipes. If I come across a yolk recipe, I’ll let you know! I’m so glad somebody finally caught that reference! =) Love me some Portlandia. Too funny. I’m a huge fan, too, so I definitely appreciated the reference. So this would explain why you haven’t had eggstras lately? 🙂 Love to those lovely ladies. Production just started picking up last week! Eggstras soon . . .